Join us for a fun shopping event and engaging evening that will include delicious food, craft cocktails, wine tastings, music and a fashion show presenting the Rossignol 18’/19′ winter collections. 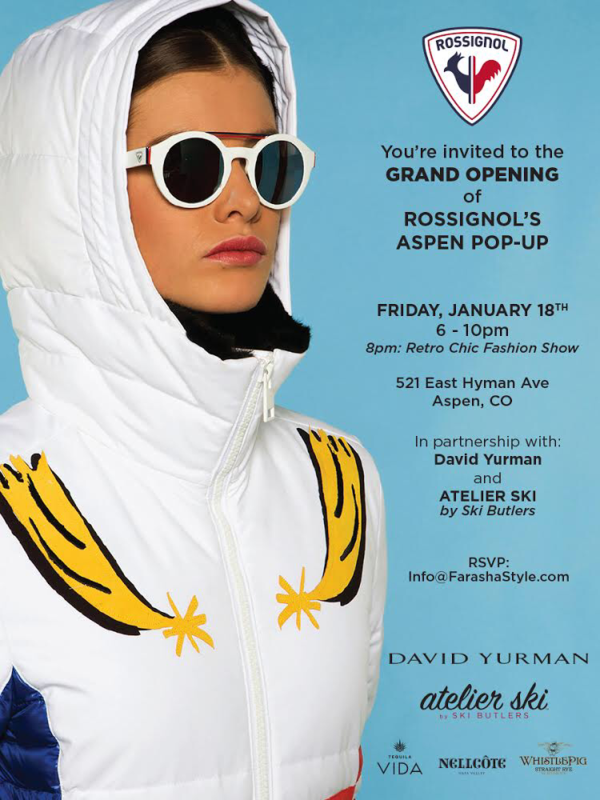 The Rossignol Aspen Pop-Up Grand Opening Event will showcase the first US Rossignol retail storefront celebrating an iconic 112 year old French brand that is truly an emblem of style and functionality in ski resorts around the world. The Aspen activation will highlight a creative collaboration with jewelry partner David Yurman featuring men and women’s collections that will complement the aprés ski jet-set culture who visit the historic ski town of Aspen. In addition, Rossignol is proud of the on-going partnership with Atelier Ski by Ski Butlers which provides an elevated and white glove demo service space that completes the experience that you will find within the storefront.